It is around 8.00 pm on August 22nd. The evening air is warm and still. The sun is low in the sky shining though a hazy veil of clouds, but the sky is not overcast. We are strolling the streets of Kings Stanley, a village on the Cotswold Way not far from Gloucester. It is not really an historic village. Most houses are relatively new and they are not particularly unique or beautiful. Yet pride shines from every one of them. Many are individually named, and the names project a certain vision of country England: Walnut Tree Cottage, Rose Nook, Clover Cottage, The Laurels, Woodland View, Jackdaw Cottage, Sunbeams, Field House, Greenfields, Manor View, The Brush (with a fading image of a brush-tailed fox beside the name). 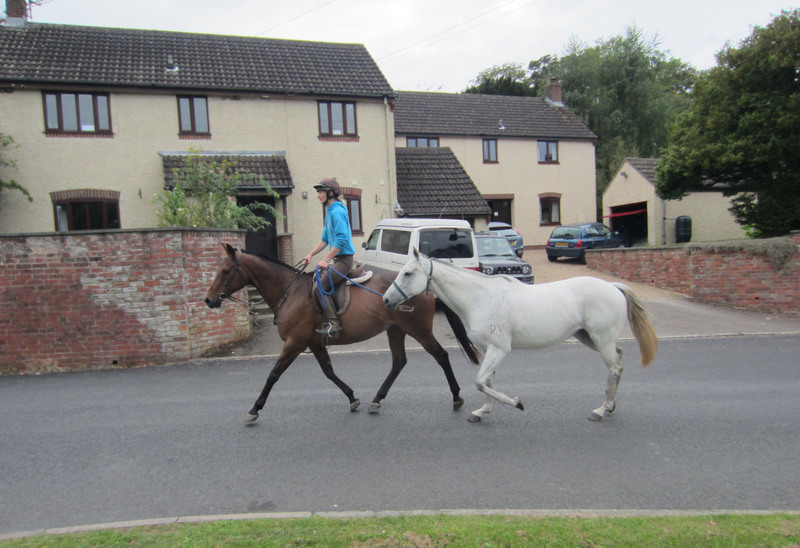 Horses in the streets of Kings Stanley. The village is built around a village green with a cricket strip in the middle. As we pass we hear the muffled shouts of young men playing soccer: playing without much skill but with seriousness and energy. The referee is clad in the officialdom of a referee’s jersey and he uses his whistle a lot. A coach bawls a stream of advice and instructions. Some excited children are running up and down the sideline. We have just eaten dinner in the upstairs restaurant of the Kings Head Inn, right beside the village green. When we arrived, just short of 7.00 pm, the restaurant was unlit and unattended. The young man behind the downstairs bar thought he knew why. Are they soup tureens, or…? A few minutes later the owner bustles in full of apology. She switches on the lights and calls the chef on her mobile. We look down the long narrow room. 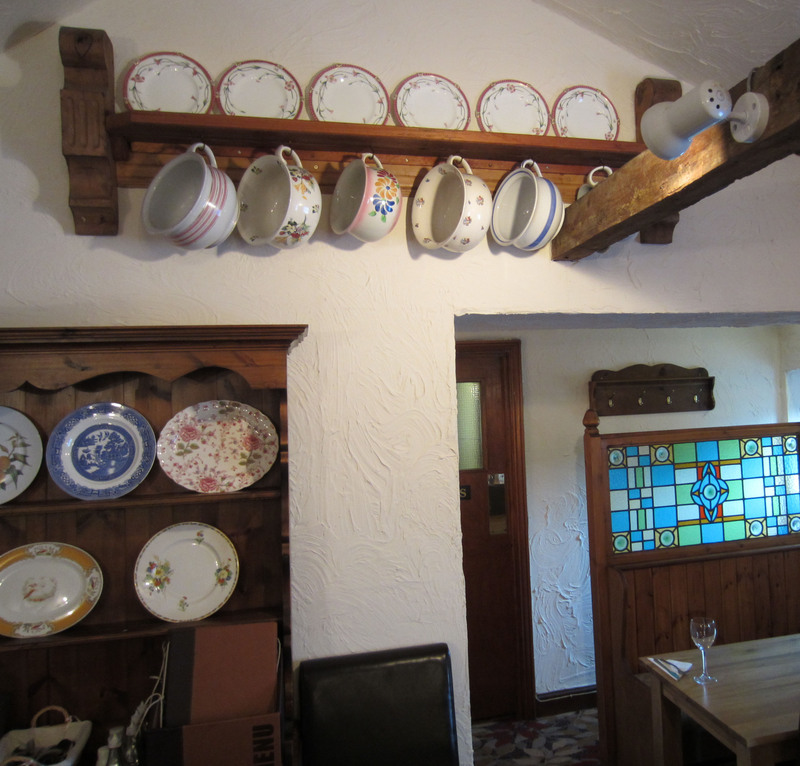 On shelves at the far end there is a display of painted porcelain platters and, hanging from hooks, a row of what look like large chamber pots. Emmy doesn’t believe that chamber pots – however antique they may be – could be used as decorations in a restaurant. They must be soup tureens, she says. Reader, I leave you to judge (see picture). When the chef turns up – a young man wearing the white jacket and checked cotton trousers of a chef – he prepares a meal that is unexpectedly delicious. I have fish and chips (to be reviewed in a later post) and Emmy demolishes a big dish of nachos. The chef fusses over us as we eat, checking that we have salt and pepper, adjusting the level of the background music and asking if the meal is to our taste. As we walk slowly back to our accommodation at the Valley Views B&B the sky has cleared and the sunlight is retreating from the hills below the village. Trees stand in ranks that criss-cross the slopes, each tree split into a half of golden light and a half of darkness, throwing a long, tapering, dark-green shadow into the lime green of the fields. There is quiet poetry in the evening of a long day. We will sleep well tonight in our garret room. The warning has come too late… we have to continue walking. 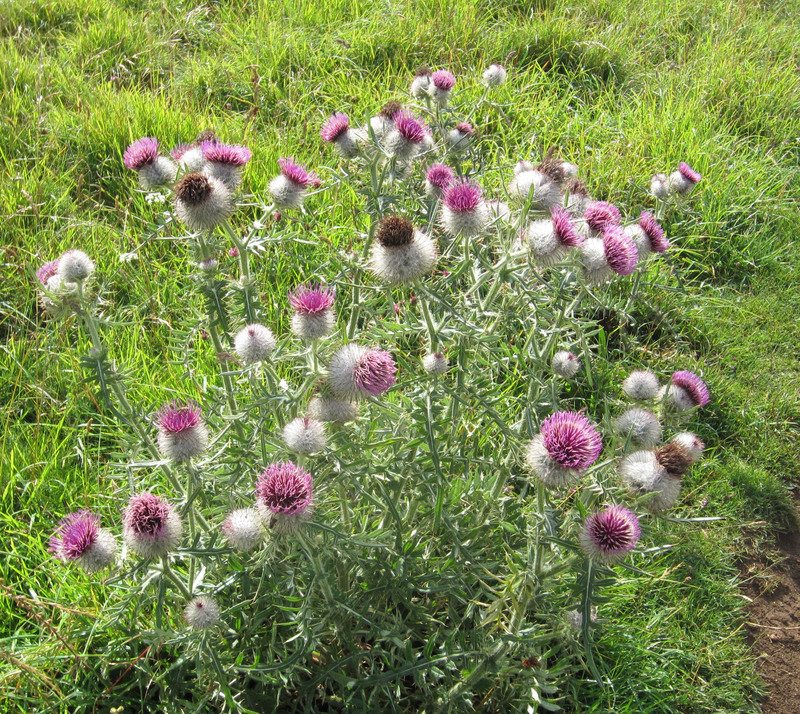 On Tuesday August 23rd we walked from Kings Stanley to the small town of Wotton-under-Edge, a distance of 25 kilometres. It was a long stretch but most of the path took us through cool woodland and we were walking on soft surfaces. Several times I stopped to listen to the silence of the woods. The Australian bush had taught me to expect a certain amount of noise: cackling and chirping and screeching. I had learned to eavesdrop on scratchy chatter and peer up into treetops full of mad laughter. I knew how to filter out the deafening sawing of summer cicadas and brush away the static of flies. But here in England… where were the birds? Where were the insects? Where was the companionship of wild voices? England’s woodlands seemed eerily empty. 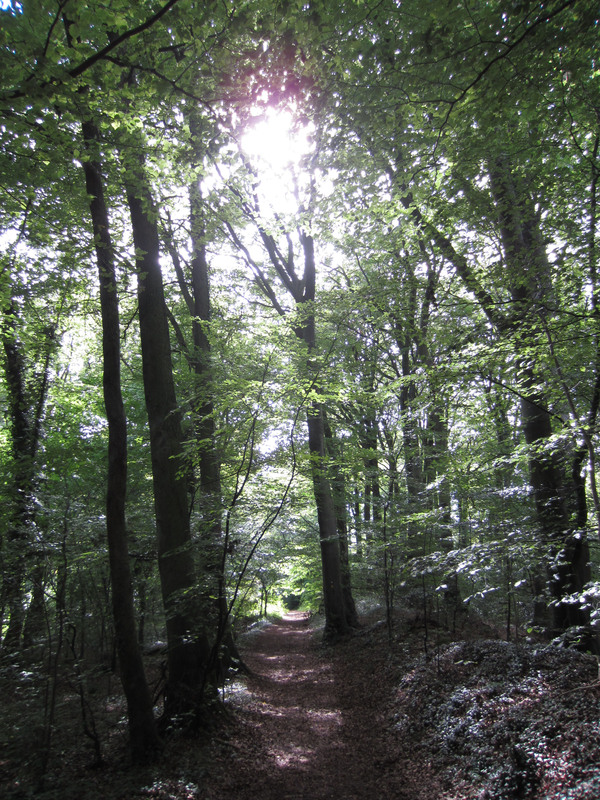 The beautiful and silent woodlands of the Cotswold Way. 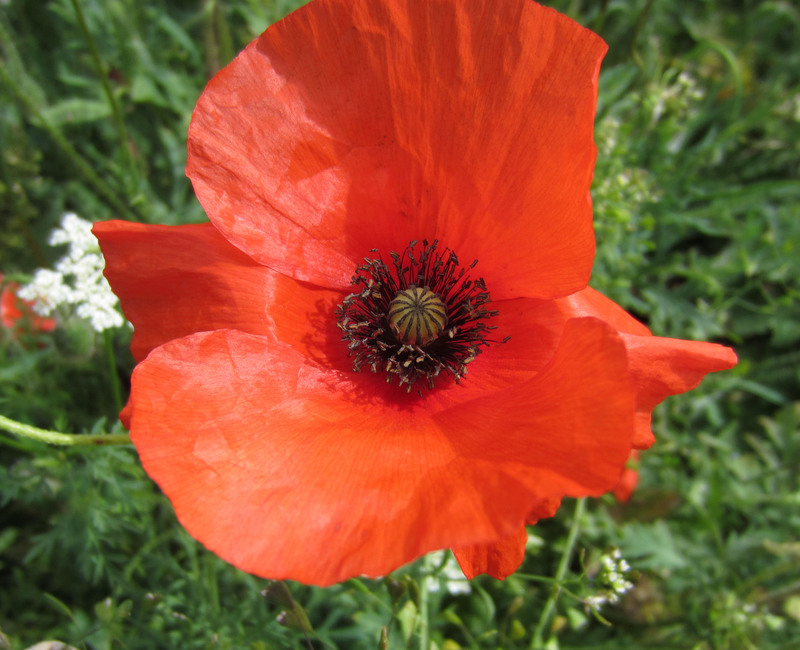 On the other hand there were plenty of wildflowers to admire: daisies and dandelions, buttercups and bluebells, brilliant red poppies, thick banks of tall purple flowers (rosebay?) and carpets of clover. 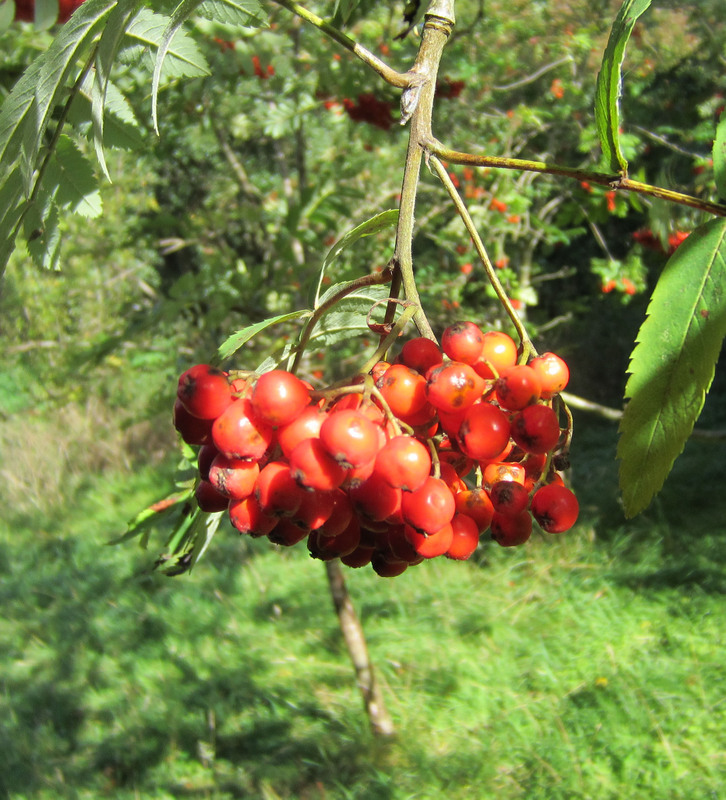 There were blackberries (edible but tart) and rowan berries, stinging nettles and bloated thistles. 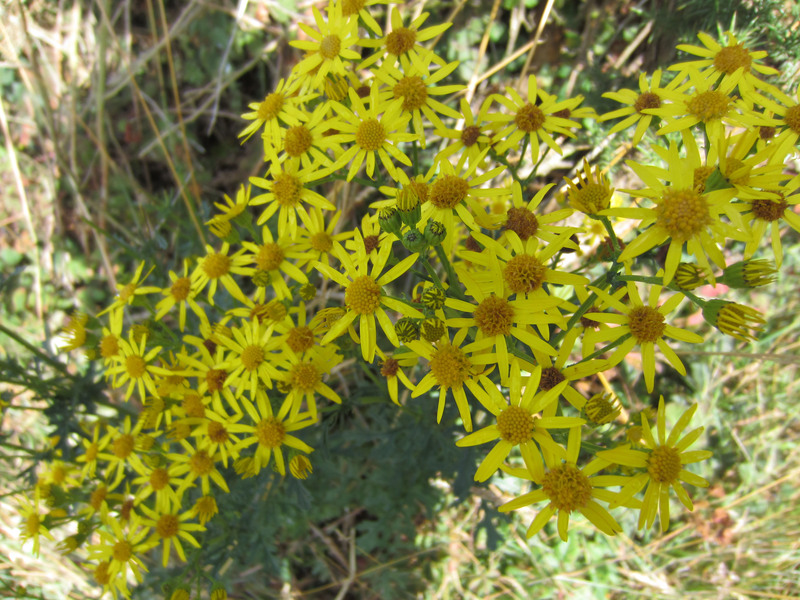 Walking between banks of rosebay. 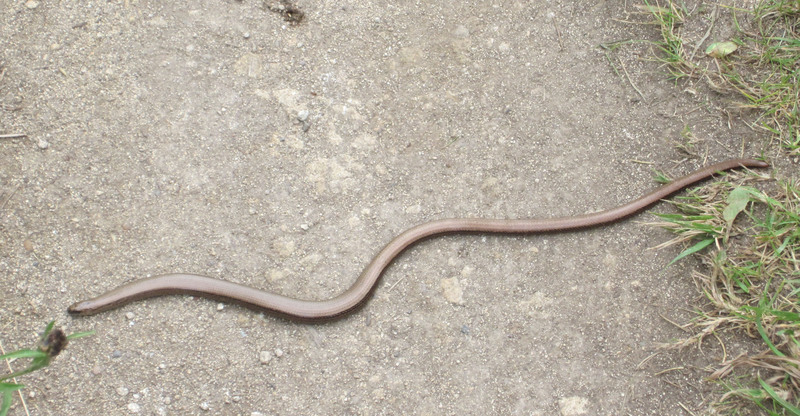 A slow-worm crosses our path (slowly). Occasionally there were signs of wild fauna. 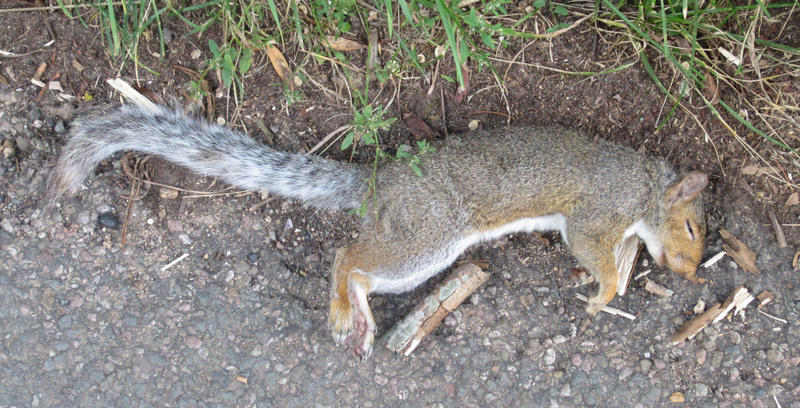 We saw grey squirrels and rabbits, but they were too quick and timid to photograph. Just out of Kings Stanley we were halted for a few minutes by a slow-worm on the path. The slow-worm is kind of legless lizard that looks like a snake. True to its name it slid very slowly across the path, a tiny tongue flicking from its mouth. 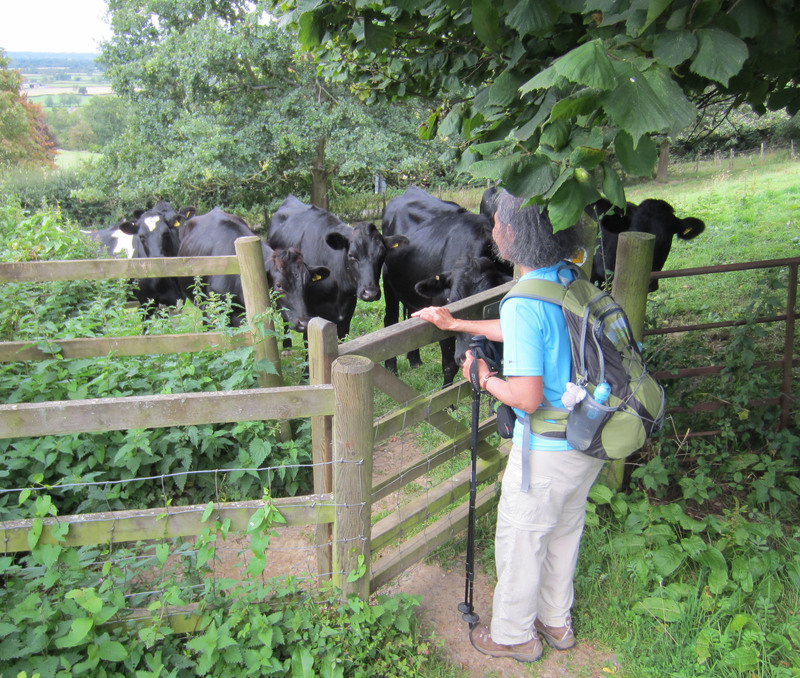 Much of the walk was over pasture where we often had to push our way through crowds of sheep and cows. There were several encounters with horses, intelligent creatures that seemed especially curious about Emmy. Emmy is harassed by a horse (I think it smells food in her backpack). And needless to say we met other walkers. Near Wotton-under-Edge I was labouring up a steep hill, puffing heavily, my heartbeat thumping in my ears, sweat stinging my eyes, when a young woman – maybe 20 years old – came gliding down the slope. She was carrying a huge backpack but had no walking poles to steady her and help her down the hill. Yet she was walking rapidly and easily as if she was on a city street hurrying to the office. I rasped out a greeting. She was rosy with good health and her teeth braces glinted in the sun. I dug my walking poles into the earth and levered myself up another step. Above me, on the summit of the hill, Emmy – who is older than me – was waiting and getting impatient. Suddenly the hill seemed steeper and I felt my age. 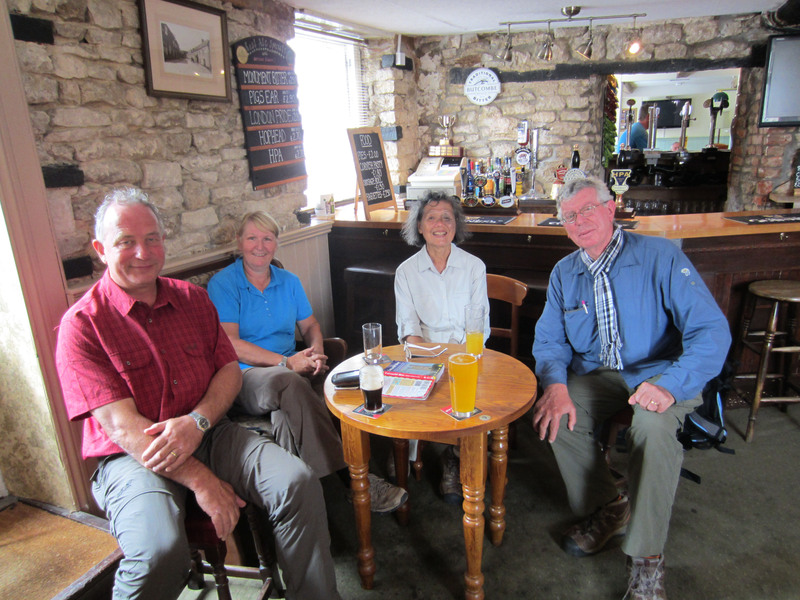 For the second half of the Cotswold walk we enjoyed the intermittent company of a Dutch couple, Ronald and Francis from Enschede, who stayed each night in the same accommodation as us. They were very fit, very focussed walkers who invariably overtook us, then fell behind again as they took detours and explored places that our speed and stamina did not allow us to reach. Apart from meeting over breakfast our paths also criss-crossed during the day: These encounters were always a pleasure. Their cheery faces are now indistinguishable in my memory from the exotic and quaint places where we met and chatted: Parsonage Street in Dursley, the Dog Inn in Old Sodbury, the Falcon Inn in Wotton-under-Edge, the Major’s Retreat in Tormarton. With Ronald and Francis in the front bar of the Falcon Inn, Wotton-under-Edge. August 25th was the last day of the walk. After a big hit of calories and cholesterol courtesy of the legendary “full English breakfast” (marmalade on buttered toast accompanied by bacon, eggs, sausage, half a tomato, sliced mushrooms – all fried – plus baked beans) Emmy and I headed out into the cool of the morning. I took deep breaths of champagne air as we opened gates into easy walking over dew-laden fields. The euphoria didn’t last long. It had rained the previous night and the “easy” paths were slick with mud. Within minutes big pancakes of clay had formed on the soles of our boots. We skidded and slipped, and had to walk lifting our knees like flamingos, stopping from time to time to scrape the clay away. We graduated to narrow incisions between banks of grass. 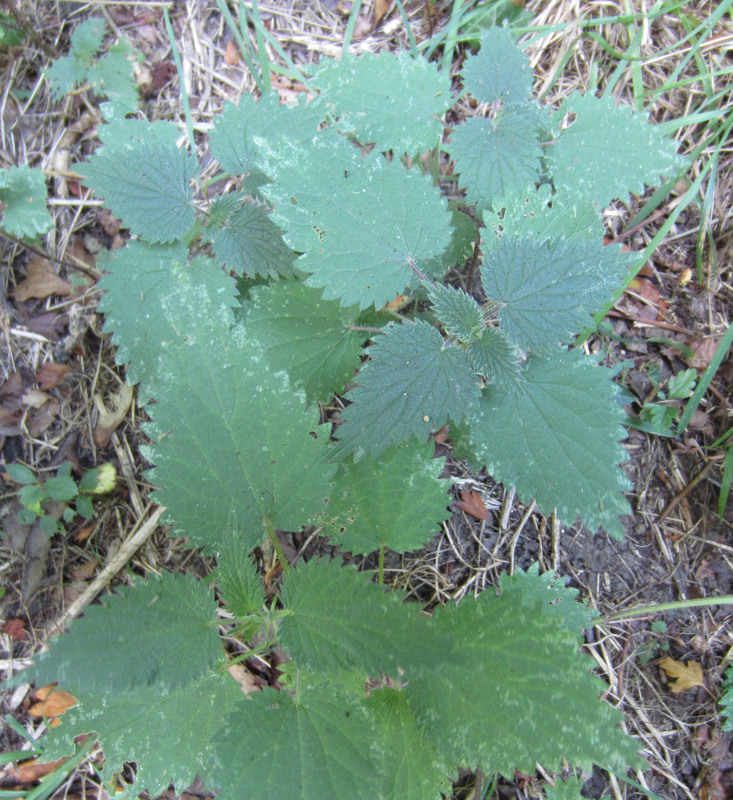 Hidden in the grass there were nettles easily able to deliver a sting through the thin cloth of our pants as we brushed past. As we walked the sky slowly darkened. Around 1.00 pm we reached the high, wind-blown fields of Lansdown where royalist and parliamentarian forces clashed in 1643. The stone walls where soldiers had crouched were still intact, and the positions and movements of troops were indicated with metal flags and information displays. But nothing else remained of the battle. The English Civil War was probably the first time in human history that an attempt was made to establish the authority of a representative parliament by force of arms. The success of Oliver Cromwell’s parliamentarians was not immediate or perfect, but its impact has rippled across the world. As I stood in the empty fields of Lansdown they dissolved into desert, the jagged stone walls acquired a plaster veneer, the sky cleared and a hot sun beat down. In my imagination I was in Libya where, three hundred and sixty-eight years after the Battle of Lansdown, the forces of parliamentary democracy were still locked in battle with the forces of dictatorship. As in 17th century England, in Libya too there would be no quick and decisive outcome. Only rarely does history instantly dismantle a worn-out order and replace it with something wholly new. In Libya the dictator Gaddafi will fall, as Charles the First did, and the supremacy of parliament will be instituted, as it was in 17th century England. But Libya now faces a testing period of transition that may, for a time, produce a “lesser” or “transitional” dictatorship, as happened in 17th century England under Cromwell and is currently happening in Egypt. Suddenly the sky unfurled veils of heavy rain. We made a run for trees at the edge of the battlefield. Water was streaming off the leaves of the canopy as we struggled into our wet weather gear. 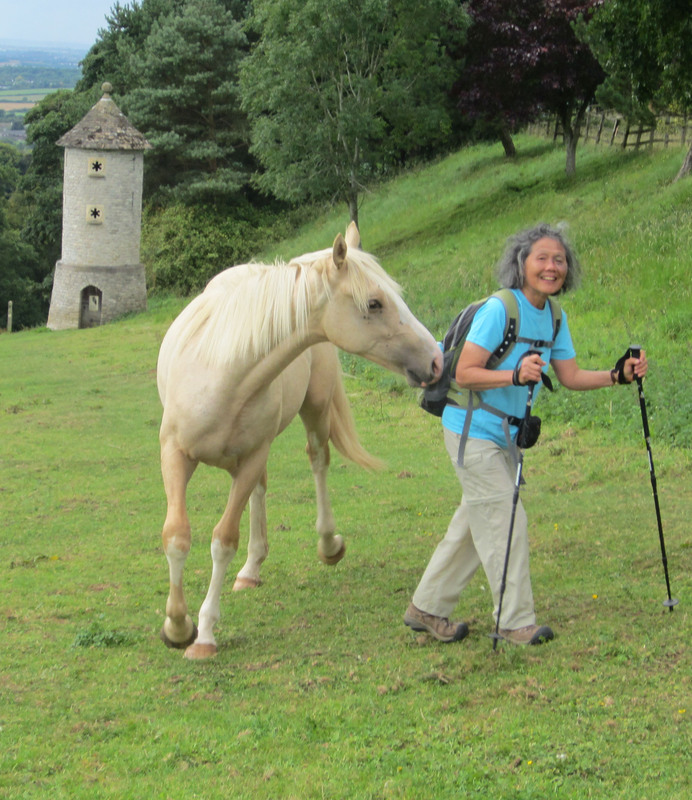 At Lansdown the Cotswold Way forks. The official “scenic” route curls five kilometres through high hills and farmland before dropping down into Bath. The “unofficial” route is a little shorter and takes the walker directly down an asphalt highway into the city. With cold water trickling down our backs we wimped out and chose the latter. Our endpoint at Bath Abbey. 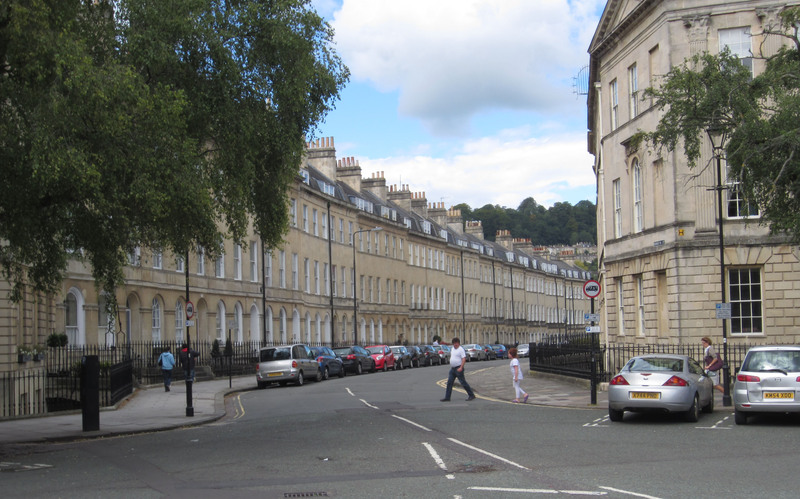 Streetscape in Bath. Our hotel was in the row of buildings on the left. 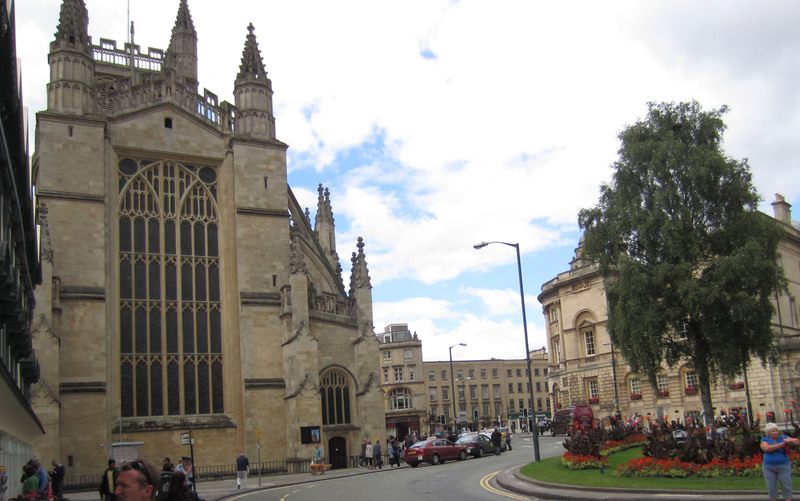 At 4.00 pm we were standing in the streets of Bath looking up at the soft grey stonework of its Regency buildings. 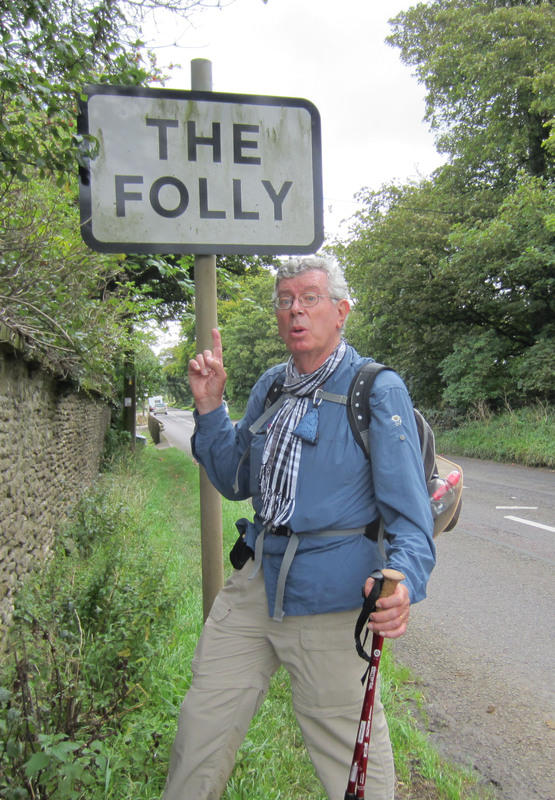 We gave Bath Abbey – the official endpoint of the Cotswold Way – a quick salute and hurried to our accommodation in the comfort of the small Kennard Hotel. 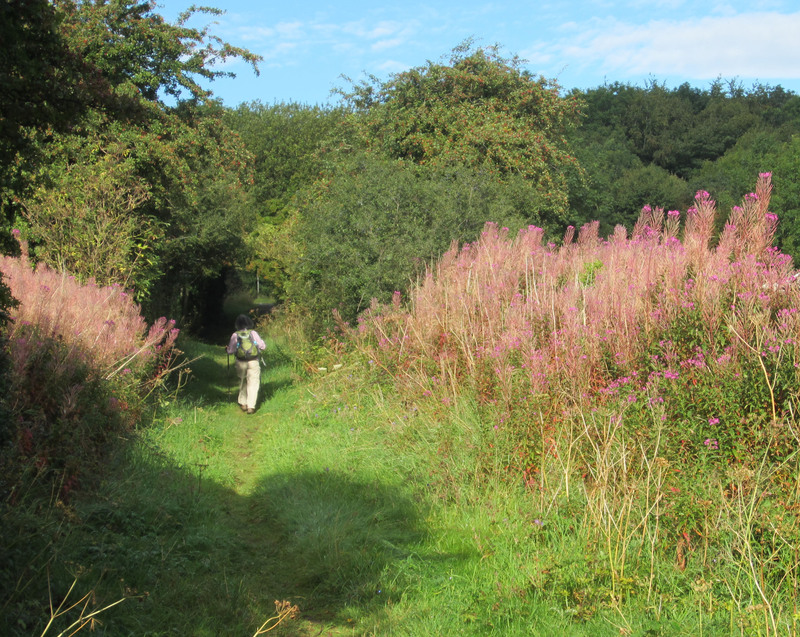 Since July 14th – a period of six weeks – we had walked the Camino’s Via Portugues, the Cumbria Way and the Cotswold Way, a total of 500 kilometres. It was time to kick off our boots and relax. 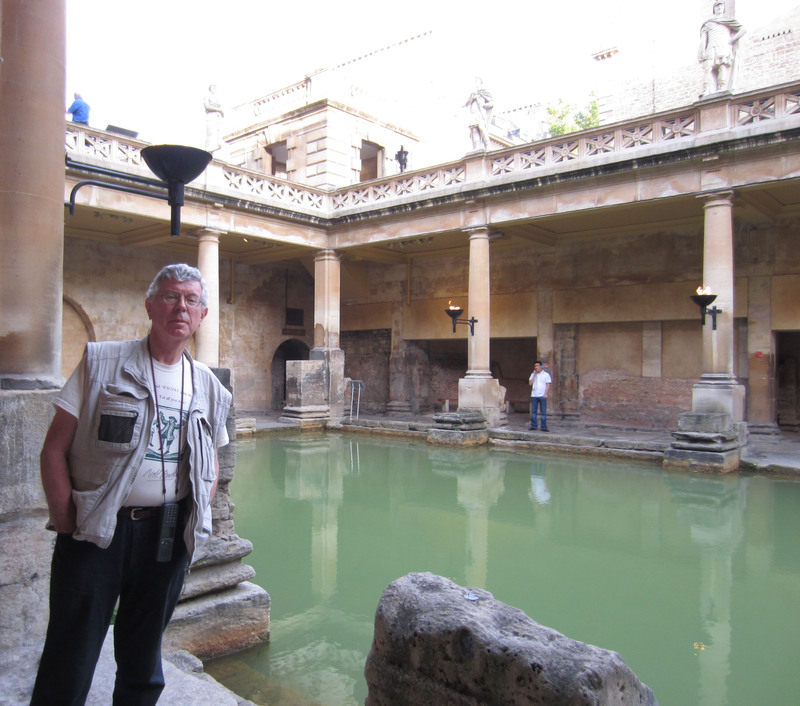 Taking in the sights of Bath: the ancient Roman baths.